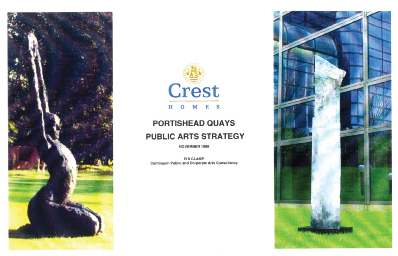 The Port Marine Public Art Programme, begun in November 1999 in Portishead, was an exciting and groundbreaking initiative for Crest Nicholson (South West) Ltd and Persimmon Homes Ltd (the Portishead Quays Consortium), and North Somerset Council. It was a major new mixed-use development on a regenerated brownfield site set around an old dockside. It was a ten-year project due for completion in 2010. It is important to realise that this was the first major participation in a Public Art project on this scale for all parties. 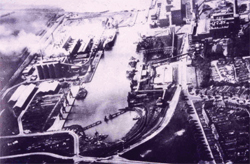 The Portishead Quays site originated with corn importation, and had a long history of industrial use such as a nail factory, a phosphorous works, and latterly a power station. It was also an important embarkation point for the ‘New World’. The old dock had extensive views over the Bristol Channel to Wales and the new Severn Bridge. 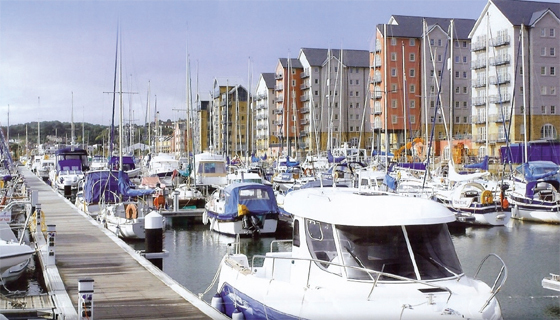 Portishead Quays Consortium, in partnership with North Somerset Council, intended to create a Yachting Marina with a range of housing types, culminating in a Fishing Village. A significant investment has been made to integrate landscape, public realm and public art in an overall vision in order to create a very special place by the Waterside – linking the town to its waterside once again. The development has been phased over 6-10 years and includes leisure facilities, two new primary schools, a new extension to the secondary school, library, an extension to the main High Street including a new supermarket, a new medical centre, and the entire infrastructure to support this growth. 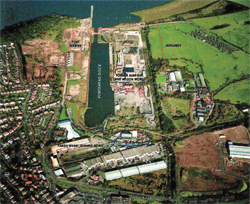 Within this major project the Portishead Quays Consortium were keen to make a commitment to developing culturally rich and sustainable forms of urban life. Both the Portishead Quays Consortium and North Somerset Council were mindful of the need to create interesting ‘places’ for the new community to inhabit and come to ‘identify with’ and ‘share ownership’ of – the very special need to connect people with place. Ultimately, the people who experience the social space determine its success or failure, responding to the context and leading to its sustainability. In a development of this nature it was therefore vital to pay due attention to the dynamics of interaction of people and space. The acceptability of the ‘breathing space’ is a significant factor in the quality of life of the community and its desirability as a place to live. Key to the successful delivery of these aims was the quality of the landscaping, public realm, and the integration of the public art. This website is created on behalf of Crest Nicholson (South West) Ltd and Persimmon Homes Ltd (the Portishead Quays Consortium) to mark the fulfilment of their commitment to the Public Art programme. 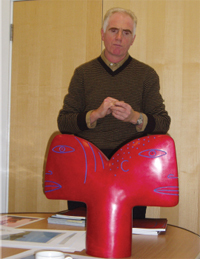 Public art was a requirement in the original masterplan submitted to North Somerset Council in March 1999. This was originally stated under the 106 Agreement when outline planning permission was granted on 31st October 1997 (Registration No. 95/0033). It was also a further requirement under the 106 Agreement (Clause No. 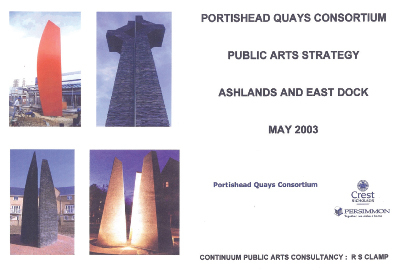 8.2.5 for Public Art) for the Ashlands (Reference 00/P/1844/OT2) when receiving outline consent on 30th August 2002. The artworks as described on this website were commissioned and paid for by Persimmon Homes Ltd and Crest Nicholson (South West) Ltd in response to the planning requirements negotiated by North Somerset Council for the regeneration of this area of Portishead. This document formally indicates that these requirements have now been completed. 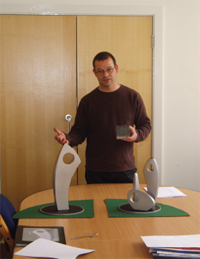 In response to these requirements two Public Art Strategies were also submitted to North Somerset Council on behalf of Portishead Quays Consortium by Robert Stuart Clamp, their appointed public art consultant. These two documents not only set out the aims, objectives and aspirations for the Public Art programme but provided a supportive framework clearly mapping the working process for its delivery. 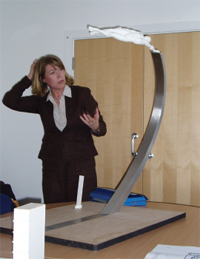 The Public Art Steering Group was central to the management and delivery strategy. It acted as a focus for debate, dialogue and the establishment of strong community links. The Steering Group met regularly and co-opted artists, members of the community, local historians and researchers, primary school teachers, the head of art at Gordano School, even a University of the West of England art student who lived in Portishead. In this way the community was increasingly informed and involved. 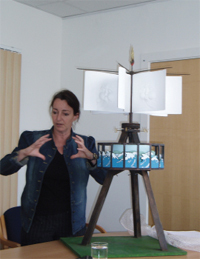 One of the most successful and entertaining aspects of the Steering Group’s function was to invite a wide range of artists to make presentations of their artwork and ideas. Probably one of the most crucial and significant factors in its success was the devolving of decision making powers by North Somerset Council under the arrangements of the 106 Agreement to the Steering Group which then could not be vetoed (exception on Health and Safety grounds) by any of the major stakeholders. This special protocol arrangement helped to create a framework of mutual cooperation and teamwork and was central to the success of the programme. All had equal representation and therefore shared responsibility. It was decided to keep formal minutes as a record of meetings. The minutes of Steering Group meetings were circulated to members, North Somerset Council, Portishead Town Council, Public Art South West, etc, and were made available to the public in Portishead Town Library and the Folk Hall. To contribute to and enrich local distinctiveness, uniqueness and identity and ensure an historical and cultural legacy for future generations, adding to the intimacy and enjoyability of a revitalised dockside realm, encouraging economic and sustainable regeneration. To send a positive message into both existing and new communities, creating both desirability and a sense of shared ownership – ‘inclusivity not exclusivity’. To foster good working relationships with the major stakeholders by bringing consultation, collaboration and partnership to the heart of the project. To successfully implement the commissioning and process practices established in the public art strategy. To give opportunities to professional artists to not only demonstrate their skills and vision but to relate to and express their response to the specific site, encouraging their creativity and innovative solutions with open opportunities within a structured and supportive framework. To strive for the highest quality artworks within public places, both delivering on time and within budget. To commission both temporary and permanent public artworks using new art/science technologies, materials and multidisciplinary synergies, thereby challenging and building new audiences for contemporary art. To seek where appropriate strong ecologically and environmentally sound solutions. To encourage educational/community involvement and interaction with the arts, extending and engendering enjoyment, an understanding of the world around us, and ownership of public spaces; re-engaging the people with their place. To create a website and supporting documentation for the Public Artworks to bring clarity of information, accessibility and understanding to both the community and the visitor – a different but no less significant form of legibility. Through the application of the Arts, bring additionality to the aspirations and quality of this regenerative programme. Help to create a legacy for future generations respecting the nature, history and heritage of the past whilst leaving space for our contemporary ‘moment in time’. Cultural: improving the range, quality, identity and feel of the built environment – demonstrating a visible commitment to a broadly based and diverse cultural heritage. Environmental: upgrading the quality of the environment and the engendering of pride of place among citizens, residents and workers – creating and enhancing a sense of place. The best environmental practices should be implemented. Community Development: encouraging and facilitating local people to have a say and make a positive contribution to the shape, and subsequent care of their environment. Economic: assisting the process of urban regeneration – rendering the environment and residential areas more commercially attractive, establishing the redevelopment’s unique identity and character in a competitive market. Education, Training and Employment: creating opportunities for local communities, businesses and artists. Spiritual: in the sense that we are presented with ideas and visual stimulus and can contemplate and encounter them in a gentle way whilst remaining in touch with nature and the elements. That non-material enhancement of the quality of life. Marketing: public art produces high quality marketing material which can be targeted to specifi c market segments, eg. tourism, a not insignificant economic contribution to North Somerset. Interpretative: putting over messages, information or signs – designed in a way that appeals to and enhances people’s reaction to places. Heritage and Historic: informing on the past and reflecting the ‘spirit of the age’. Creating clues, signs and symbols relating to the heritage of place so it can engage both our eyes and minds, stimulating and surprising. Allowing people to place themselves in the context of history’s various time-threads. Fun: making the quality of our experiences richer, and appealing to the child in us all. It is interesting to reflect on how successful we have been in achieving a positive response to each of these original aspirational aims, as indicated in the following documentation. "By making social space integral to the living experience, it engenders ownership and identification, thus contributing to a real sense of place – ‘people not public / place not space / homes not houses’." This website www.publicartportishead.co.uk along with the Public Art brochure (published May 2009) records the activities of the public art programme over the last ten years. 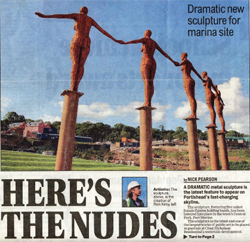 It also demonstrates that the Portishead Quays Consortium, in collaboration with North Somerset Council, have fully engaged with the spirit, aims and aspirations established for this public art programme, and more than met the requirements of the 106 agreements and the original masterplan. A cultural sea-change has washed through Portishead over the past decade. More than twenty world-class visual artists have created public artworks that respond to the town’s rich history and heritage. Contemporary and traditional, figurative and abstract, reaching to the sky or rooted closed to the ground; the resulting works are startling in their diversity yet united by a common exploration of people and place that embeds them in the local community. This artistic renaissance has been precipitated by the creation of Port Marine, an acclaimed mixed use development, set around a new marina, that regenerates a disused brownfield industrial site. From the mid-Victorian era onwards, Portishead enjoyed a global sphere of influence as ships from across the world carried cargoes to and from its deep water dock. 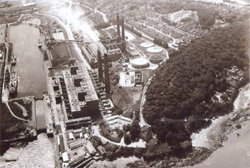 These glory days faded in the 1980s when the closure of the town’s dockside power station forced much associated activity to a halt. Port Marine has once again placed the docks at the heart of the town, a vibrant centre where people work, live and relax. Both physically and ideologically, the public artworks link the existing and new Portishead. They celebrate many facets of the town’s history – its people, seafaring, industrial activity and even the famous Portishead radio station – and provide a unique and potent testament to the phoenix-like character of the site. The public art trail provides a cultural legacy that will inspire, educate and entertain generations to come. This artwork trail is dedicated to the community of Portishead, past, present and future.